They are custom-made, on-site at Baldwin Sales for a quick turn-around. 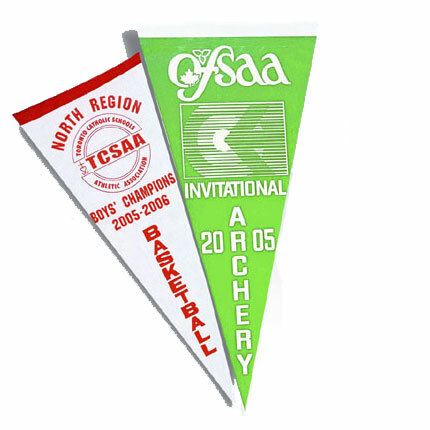 Vinyl, Felt or Tackle Twill materials are available for the background of the pennants in a wide assortment of colours. On Vinyl, special inks are airbrushed onto the material to create a great looking and durable product. Special letters are cut out or silk-screened and then heat sealed onto Felt or Tackle Twill. 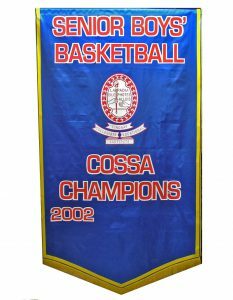 Add monochrome or multi-coloured logos to dress the pennants up. Prices include a 1-colour print. 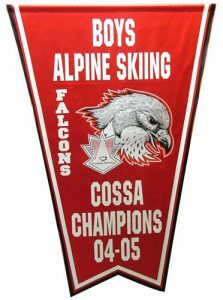 For felt and Tackle Twill add 15% Extra Colour: add $2.95 each Line Pattern for each line change on pennants, please add $3.50 (eg.